Wow!! Words fail me – well almost because this wouldn’t be much of a review if it had no words at all. In short this book is scary, not altogether surprising since it features an old house in London jam-packed with the previous owner’s belongings including a collection of stuffed birds. Told through a written letter between Sydney Baker and Jack Walsh detailing all the events and most intriguingly the secrets they’ve kept from each other. The author’s choice of this somewhat unusual writing style becomes absolutely clear but not until far later, in the meantime the freshness of the exchanges between the pair are hypnotic and make for totally compelling reading. Now I don’t usually go in for gothic type books but if they are all as excellent as The House, I might well change my opinion. Only incrementally are the cause of the strange smells, the sounds that keep Jack on edge at night and the other events that turn their new beginning into a nightmare revealed in what I think is a masterclass of suspense writing. Yes, so far, all so textbook, albeit in the advanced section, but there is an element which really brings this book to life. The narrative in the first person is so well written, so close to actual speech that you can hear Syd and Jack talking to you it felt that real. There are moments of tenderness which alternate with phrases that capture the language those who practice defiant guilt, we hear of hard times behind the couple and hopeful times ahead and mixed amongst all of this are some genuinely funny moments as well as phrases that conjure up a whole heap of emotions behind what appears to be the throw-away lines. Now I’ve seen enough horror films in my time to know never to go wandering about alone when there’s a suspected zombie in the vicinity, feline or otherwise. But there was no way I was going back to sleep, not until I’d at least had a quick look around. Plus, countering whatever fear I felt, I heard my dad’s voice telling me to stop behaving like a six-year-old. About the only thing my father was afraid of was the prospect of maybe one day being called upon to express and emotion that wasn’t indignation. There is misdirection aplenty and with a setting in a creepy house, two very dissimilar protagonists, ex-junkie Syd and the more laid back, but not entirely without issues Jack. Add to that the background of the purchase I was unsure what direction the book was going to take from the outset, but boy did I enjoy the journey. But honestly right? The truth, the whole truth and nothing but. Honestly then, what I thought when I walked into the house was that it was somewhere Jack and I could be together until we were old. A forever house, that’s what they call it on the property shows, which when I hear it always makes me want to puke. But that didn’t stop me thinking it even so. In case you haven’t got it, I loved this book, it is definitely one of my books of the year because not only was it compelling reading (if I’d known how compelling I would have waited for a less busy time so that I didn’t keep having to put it aside) but it had dark parts, light parts and each one was perfectly placed. The House delighted me whilst scaring me, it engaged me and inspired me to really look at the writing to try and work out what it was about it that made this book one that I’d have happily started all over again the instant I turned the last page. 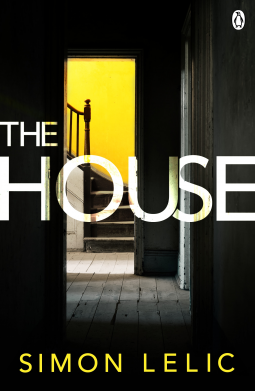 I’d like to say a huge thank you to Penguin who allowed me to read a copy of The House prior to publication on 17 August 2017 (psst it is currently at an absolute bargain price for pre-order for the eBook in the UK) and the author Simon Lelic for delighting me, this review is my totally gushy but absolutely unbiased thanks to them. You had me creeped out at ‘stuffed birds’ *shudder* Sounds great! It was so good the mix of creepiness and the humour in the writing was a very winning combination which I imagine was hard to ‘pull-off’ but it worked for me! I’m currently reading this book, Cleo. Whilst I’m not loving it as much as you did, I totally agree with you that it’s unique narration! Wow! I’m reading this this weekend, and wow! Fab review! I love how realistic, creepy, and unusual it sounds! I think the first person narrative really works in this one and keeps you in the creepy story! I have this one on my TBR pile, so I’m glad to hear you enjoyed it so much. Like you, am sometimes doubtful about Gothic horror in a narrative, but when done well it can be so effective (Shirley Jackson). And the unusual choice for narrating it attracts me too. Although the book starts that way it morphs into another kind of tale but the creepiness lingers… I loved the style of narration which is probably what made it such a stand-out read for me. Your enthusiasm about the book definitely has me convinced.It sounds scary but an addictive read at the same time. Check out the book, The House, by Simon Lelic, as featured on the Cleopatra Loves Books blog. What a fantastic review! I have this one and have a feeling I’m going to love it! Thank you it is one of my favourite reads of the year so far – I hope you enjoy it too! I really enjoyed this author’s The Child Who which I read a few years back and this was another exceptional read – a definite hit for me! A creepy house always piques my interest, and your review reeled me in further. Thanks for sharing! Lost for words? I need to read this book! I know!! How stupid can some people be? It was the language that really made this book for me, there were so many phrases like that which just made me conjure up a brilliant picture without any need to labour the point. Never heard of this one. You know, you are a very enthusiastic reader. It’s one of the things I like about you. I get very excited when a book really works for me! I have to say, you have TOTALLY made me want to read this one!! Great review! I tried to get this and failed. It sounds epic.